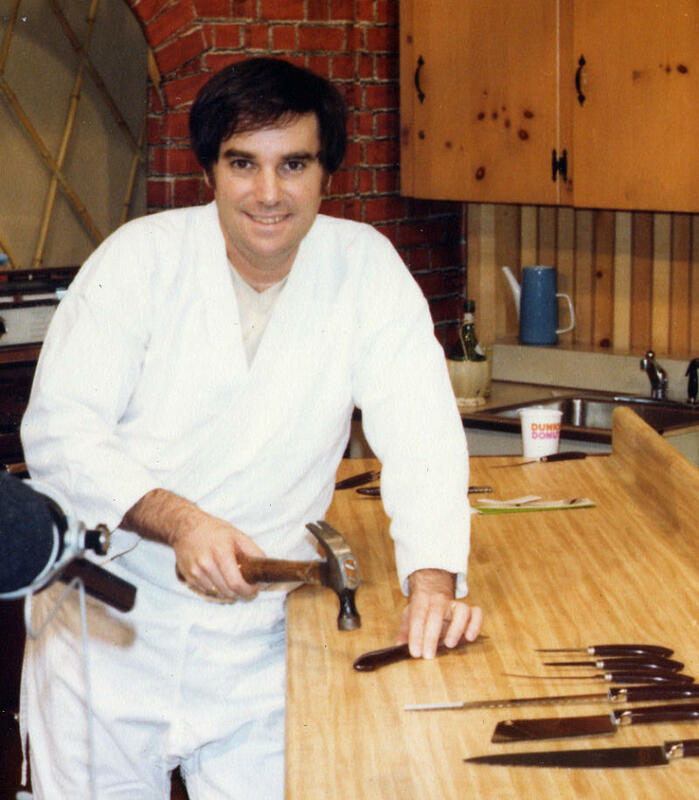 WEST PALM BEACH, Fla. (AP) — The marketing mastermind and infomercial pioneer best known for introducing American TV viewers to Ginsu knives, the miracle kitchen tool that sliced through tin cans and chopped wood, has died. Barry Becher was 71. But as Becher's commercials promised, "Wait, there's more!" Becher also brought viewers the Miracle Slicer, Armourcote Cookware and a bevy of other products he pitched with his business partner Ed Valenti. The duo's signature style of advertising coaxed consumers to act fast because supplies were limited. Satisfaction was always guaranteed. Becher had been suffering from kidney cancer and died Friday at a hospital of complications from surgery, his stepdaughter Stacy Paradise said Wednesday. He had lived in Parkland. Becher was born in Brooklyn. His father was a chemical engineer, his mother an opera singer. He left for Rhode Island after high school, passing broken-down cars on the highway. He figured he might be able to make a living in the auto business. Becher was running two AAMCO franchises near Warwick, R.I., when he met Valenti, an account executive for a local television station who was handling the auto shops' advertising. They drove the same Datsun 240Z, had wives who were schoolmates, shared a passion for sales and became fast friends. They decided they wanted to find a product they could market through an extended TV commercial, the way some records were sold. Becher found a mohair-bristled paint pad that prevented splatter and cut work times. They were roundly rejected when they pitched the product to Madison Avenue firms and ultimately produced it themselves through a joint company, Dial Media, initially run out of Becher's garage. Their first two-minute commercial was on the air, and the Miracle Painter was born. They sold more than a million units and repeated their winning formula with products others created. But the duo rechristened and popularized them. Flatware became newly exciting as Lusterware Silverware and mixing bowls were made must-haves as Royal DuraSteel. "We tried to find the most unique products in the world," Valenti said. In the course of a decade, the men said they amassed more than $500 million in sales. Armourcote was the most profitable, but Ginsu remains the most widely known, a household name across the U.S., and fodder for countless comedians. Millions were sold from the commercial's debut in 1978 into the early 1980s, with audiences mesmerized by images of an exotic-sounding knife that seemed able to cut through anything. The infomercial promised a 50-year guarantee and "much, much more." Sam Craig, a marketing professor at New York University's Stern School of Business, said Ginsu stands apart from most other infomercial products because it was popular for so long and it had common sales methods that are used to this day. "They're taking these things that were done at state fairs and carnivals where it could be demonstrated to a group of maybe 10, now you could demonstrate the same thing to a million people or more at the same time," Craig said. "And it takes something that's relatively mundane and makes it appear dramatic." Becher and Valenti eventually shifted their business to become mainly a media buying firm, PriMedia, but their legacy was sealed. They helped popularize the use of credit cards and 800-numbers for over-the-TV sales and their work is seen as a precursor to extended 30-minute infomercials and round-the-clock shopping channels, including Home Shopping Network. Becher's funeral was held Monday. His family is considering etching on his tombstone "But wait, there's more."